Tonight’s show at The Tivoli is the first of an extensive national tour for Australia’s favourite punk-rock heroes, The Living End, and the band’s long-time fans are out in full force. The venue is sold out, and plenty of eager punters have arrived early to get a good spot for the main act. With supports 131s and Bad//Dreems, the night promises to be one filled with scuzzy punk guitars, catchy hooks and sharp-tongued lyrics. Unsurprisingly, the crowd exudes an overwhelming ‘dad’ vibe, the beers are flowing fast and every second person is wearing a Living End tour shirt circa the early 2000s. Even though this tour is for the band’s latest album Shift, the first new music from them in five years, it’s a lot more like a ‘greatest hits’ show, which of course makes everyone pretty happy. Melbourne’s 131s open the night with a tight set filled with plenty of loud and fast guitar fret-work and catchy bass lines, though not as many guitar scissor kicks as their sound easily lends itself too. It’s a little difficult to delineate the individual songs, they all kind of blend into half-hour of that kind of colour-by-numbers punk rock Green Day patented a decade ago. It’s not entirely my cup of tea, but the apparent target demographic (i.e. all the dads in the audience) really enjoy it. They do a stellar job of getting the crowd warmed up and in the mood for some more music, which is exactly what they’re there for so in that sense they do a bang up job. Next on stage is Adelaide’s Bad//Dreems, who turn the punk down and the garage up, for a set of guitar rock of the decidedly more jangly variety. Perhaps it’s the way front man, Ben Marwe’s mullet catches the light, but whatever the reason, the band soon have the crowd mesmerised. Hiding To Nothing and My Only Friend (about Marwe’s mother no less) get a great reaction and at some point a rabid fan even jumps onto the stage to sing a chorus. After a few goes on the mic with Marwe the fan in his infinite wisdom decides to dive into the crowd without warning and in scene not unlike some kind of comedy sketch, he hits the ground like a lead balloon as his fellow punters step out of the way rather than catch him as he assumed they would. If the crowd weren’t warmed up before they certainly are now, and if the soaring temperature of The Tivoli is anything to go by, everyone is definitely here and ready for the main event. When The Living End finally do walk onstage they’re met with rapturous applause. Before they even strike the first note the crowd are completely enamoured, these three can do no wrong. Opening with One Step and then following with Monkey sends everyone into a frenzy. There’s not a single person in the room who doesn’t seem to know every single word and the band are lapping it up. The room reaches fever pitch when the band play Second Solution and Roll On back-to-back. 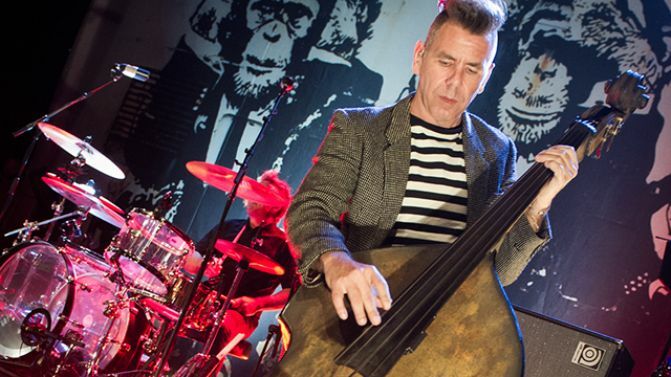 At one-point bassist Scott Owen literally stands on his double bass while playing. It’s not just about the gimmicky, albeit impressive, circus feats though, the band are well-rehearsed and as tight as they’ve ever been. Playing a career-spanning set, there really is something for everyone. Halfway into the set they play the lead single from their new album, Keep On Running, a criminally underrated track that mixes just a dash of Coldplay-esque guitar riffs with that classic Living End sound without being pretentious. There are crowd surfers and mass singalongs throughout the hour-and-a-half set. Staring Down The Barrel and Prisoner Of Society were standouts but it was when the notes to White Noise began that the roof really did seem at risk of coming down. The band, as the consummate performers that they are, revelled in the hysteria, letting the punters yell the last chorus acapella before returning to the stage for a three-song encore that finished with Carry Me Home (with another stage invader). It was a nostalgic night for many and a great celebration of a trio that have been giving Australians plenty to thrash around to for more than twenty years.